Garda College claimed their first ever Student Sport Ireland/IRFU Brendan Johnston Cup with a 24-12 win over IT Carlow in Buccaneers RFC on Wednesday March 21st. A powerful second half performance from the Garda College drove them to glory as they held IT Carlow scoreless and had crucial second half scores from Jamie Heuston, Gavin Heuston and Alan Gaughan. In a repeat of last year’s final, it was first blood to the Templemore based outfit as persistent pressure from the forwards yielded a penalty, that was slotted between the posts by Alan Gaughan. After weathering the early pressure IT Carlow kept their goal line intact and turned defence into attack for a superb opening try that was touched down by David Murphy from Naas and was converted by Aiden McDonald to give IT Carlow a 7-3 lead. The response was immediate from Garda College with Eoin Doyle breaking the IT Carlow line to touch down for a try which was converted by the boot of Alan Gaughan. Both sides were now going hammer and tongs at the game and the frantic pace made for enjoyable watching for the big crowd and the fast hands of the IT Carlow backs saw David Murphy get in for a second try to establish a 12-10 lead. The final act of the opening half fell to Alan Gaughan who kicked a mammoth penalty to give Garda College a 13-12 lead at the interval. Garda College who had fallen short by one-point last year were really focussed for the second half and as they stepped up the pace they forced IT Carlow into conceding numerous penalties which eventually saw Alan Gaughan kick three more points and ended with IT Carlow having a player in the sin bin. 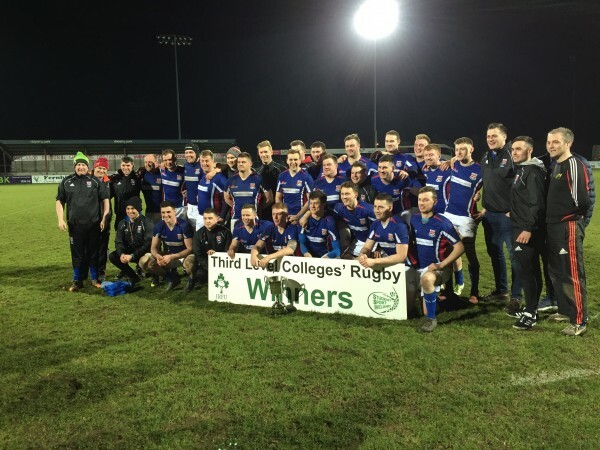 Momentum was with Garda College now and a moment of genius saw Gavin Heuston drop a goal to make the lead 19-12, and the game was sealed when his brother Jamie Heuston got in for a try in the left corner to cap victory for Garda College. Conor Muldoon (Nenagh RFC), Barry O’Connor (Gorey RFC), Eoin King (Navan RFC), Gary Crowe (Garda RFC), Kevin Seymour (Nenagh RFC), Vinny Lyons (Scarriff RFC), Leon Fox (Midland Warriors), Sean Glynn (Mallow RFC), Gavin Heuston (Kilfeackle RFC), Alan Gaughan (Buccaneers RFC), Fionn Mulligan (Garda RFC), Brendan McSweeny (Clanwilliam RFC), Eoin Doyle (Boyne RFC), Dylan Sheehan (Garryowen), Jamie Heuston (Kilfeackle RFC) subs Gary White (Garda RFC), Shane McGuire (Naas RFC), Colm Randle (Ashbourne RFC), Jack Codyre (Galwegians RFC), Declan Byrne (Buccaneers RFC), Shane Eoin Kennedy (Ashbourne RFC), Michael O’Neill (Clanwilliam RFC). Ext panel Martin Cocoman, Shane Claffey, David Harney, Shane Maloney, David Biggins, Eoin McCabe, Niall Murphy. Ola Ogunkoya (Boyne RFC), John Murphy (Carlow RFC), Ntinga Mpiko (Lansdowne RFC), Ronan Scott (Navan RFC), Joe Carley (Enniscorthy RFC), Nick Doyle (Enniscorthy RFC), Jack Nolan (Waterpark RFC), Michael Russell (Naas RFC), Isaac Daly (Waterpark RFC), Aiden McDonald (Kilkenny RFC), Seamus Curran (Carlow RFC), Darragh Murphy (Lansdowne RFC), David Murphy (Naas RFC), Patrick Connors (Dungarvan RFC), Rhys Davies (Enniscorthy RFC) subs Shayne Fleming (Carlow RFC), Idris Rqibi (Kilkenny RFC), Calum Finnegan (Enniscorthy RFC), Graham Brennan (Navan RFC), Sean Cremin (Kanturk RFC), Calum Murphy (Wexford Wanderers). 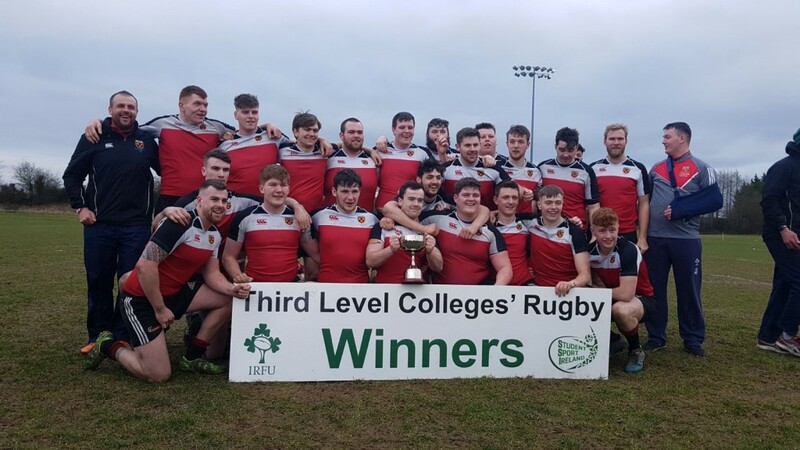 IT Carlow did have the consolation of claiming the Student Sport Ireland /IRFU Men’s Rugby Tier 2 Cup final as their second string saw off the challenge of Galway Mayo IT earlier in the day. 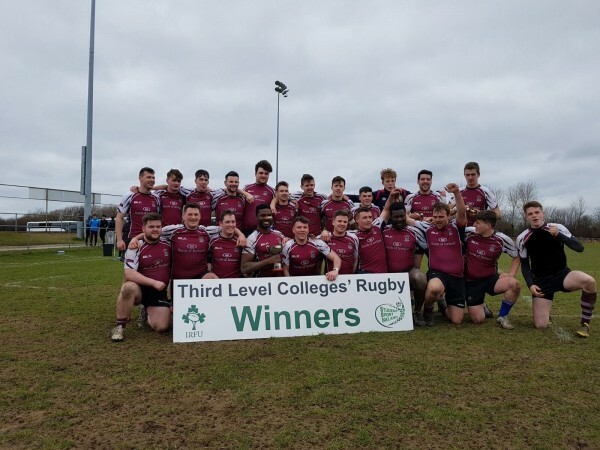 GMIT who were going for a league and cup double and were also cup winners of Tier 3 in 2017 provided stiff opposition for the winners in what was a ding dong battle. GMIT lead at the break 14-12 with two tries in the opening half by Chris McCormack, while IT Carlow’s tries came from Bryan Murphy and Keith Melbourne. The sides were level at 19 all midway through the second half with Sean Cremin and Joshua Graham touching down for their respective sides. A second Keith Melbourne try converted by Conor O’Hagan pushed IT Carlow into a 26-19 lead, but GMIT would not go away quietly and were back within two when Jack Haugh touched down. IT Carlow ‘B’ were not to be denied as a penalty from Conor O’Hagan sealed victory. The opening SSI/IRFU Men’s Final of the day saw NUI Galway capture the Men’s Tier 3 cup final with a 38-10 win over Dundalk IT. A tight first half saw NUIG head to the changing room 7-0 in front after a try by John Kennedy and conversion by Evan McGoloin. Taidgh Kavanagh got Dundalk IT on the board with a penalty early in the second half but tries from Martin Molloy and Michael McDonnell which McGoloin converted put NUIG 21-3 in front. DKIT hit back with a try by James McCann which Taidgh Kavanagh converted, however NUIG finished strongly with three tries as Jack Gavin, John Kennedy and James Costello touched down to seal the win.